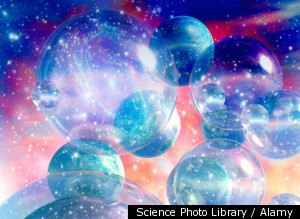 Is there more than one physical universe? Why is Earth's climate changing so suddenly? At what point will intelligent machines pose a threat to the men and women who invent them, not to mention the rest of humanity? Many forward-thinking writers have pondered these questions. But none has approached them quite like Whitley Strieber, who says many of his ideas were formed after a mysterious stranger visited him in a hotel room in the middle of the night in 1998. Strieber is the internationally best-selling author of numerous books that have been made into feature films, including 1987's New York Times No. 1 non-fiction bestseller "Communion" (his account of a close encounter with what he calls intelligent non-humans), "The Wolfen" and "The Hunger." In the early morning of June 6, 1998, Strieber was asleep in his room at the Delta Chelsea Hotel in Toronto when there was a knock at the door. "I got up to open the door, thinking it was the room service waiter. It was not. It was a man I described as about 5 and a half feet tall, older-looking, like someone in his 70s. He wore dark-colored clothing, a turtleneck and charcoal slacks," Strieber told The Huffington Post. Strieber's unannounced visitor stayed nearly an hour and never sat down or walked around -- he stood, motionless, by the window. As the stranger spoke, Strieber took notes, eventually privately publishing the first edition of his book, "The Key," two years later, in 2000. Strieber's visitor spoke about science and ethics, and when the author asked about machines, the stranger replied: "An intelligent machine will always seek to redesign itself to become more intelligent, for it quickly sees that its intelligence is its means of survival. "At some point, it will become intelligent enough to notice that it is not self-aware. If you create a machine as intelligent as yourselves, it will end by being more intelligent." Both Strieber and his visitor agreed this was a potentially dangerous scenario. 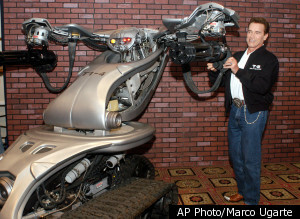 In a new edition of "The Key" (Tarcher/Penguin), Strieber cites the June 2010 issue of Scientific American, which discussed self-aware robots (like those depicted in the "Terminator" movies): "Once a machine can understand its own existence and construction, it should be able to design an improvement for itself," the article suggested. According to Strieber's account, the stranger -- whom the author has since called the "Master of the Key" -- spoke continuously about topics ranging from science to human potential and psychology. It was, Strieber says, "the most extraordinary conversation I have ever had in my life." Certainly, skeptics could have a field day with someone like Strieber; the author first offered readers an account -- "Communion" -- of being abducted in upstate New York by non-human beings in 1985. But Strieber also has a reputation as a well-respected, rational individual who spends considerable time and effort investigating the things he writes about. "For more than two decades, I have been interacting with Whitley Strieber and found him to be one of the most intelligent and thoughtful researchers in the field," said John B. Alexander, Ph.D., former Green Beret commander, developer of weapons at Los Alamos, N.M., and author of numerous books, including "UFOs: Myths, Conspiracies and Realities" (Thomas Dunne Books). "There is no doubt he has had some very strange experiences -- ones that even he does not claim to fully understand," Alexander told HuffPost. "While some details may be in question, we certainly agree that the universe is far more complex than anyone has imagined." Strieber's curiosity about the things told to him by his mystery Toronto visitor led him to investigate further. "The statements he made were so interesting that I researched some of them in detail, in particular, what he said about how ice ages happen. As I looked into the scientific literature, to my surprise, I found various papers that added up to exactly what he had described in quite a bit of detail. In those days, the information hadn't been drawn together before the way he put it together." Strieber's visitor had suggested: "Human activity has sped up the process of atmospheric warming, so the change will be sooner and stronger. The greater part of human industry and culture, along with the species' most educated populations, will be destroyed in a single season." That information given to Strieber by the mystery man formed the basis of a book co-written in 2000 with legendary radio talk show personality Art Bell, "The Coming Global Superstorm," which evolved into the 2004 apocalyptic film "The Day After Tomorrow." The concept of multiple universes was also a topic of conversation that night in 1998. "There are more galaxies in your universe than there are stars in your galaxy, and more universes in the firmament than there are galaxies in your universe," the stranger told Strieber. "There will come a day when mankind will learn how to detect universes beyond. But most are so far away that their light has not yet reached your universe, since the day of its inception." Heady stuff to be sure, but there are growing beliefs in the existence of more than one physical universe. "In the realm of far out ideas in science, the notion of a multiverse is one of the stranger ones," noted the space and astronomy news website Universe Today, in January. "Astronomers and physicists have considered the possibility that our universe may be one of many." At one point, Strieber asked his strange intruder an offbeat question. "I've always been interested in definitions, because in the Bible, the Ten Commandments are there but there's no real clear definition of what sin is, in a fundamental sense -- how we can use the words to evaluate our lives as we go along: Am I doing something that is ethically good? Am I being worthwhile in my life at this moment?" Strieber's encounter with his visitor ended after 45 minutes. "I wanted more information about him, and at that point, he said, 'Would you drink this.' He was holding a glass in his hand and it had something in it that looked like milk, and without questioning it, I drank it immediately and it put me to sleep right away." Strieber has never fully concluded who or what his 1998 visitor was. As hard as he tried to find the unusual man, Strieber never saw him again after that night. "It's possible that this was no ordinary human being. I asked him his identity in many different ways, and he was pretty coy and very amused by my attempts to find out who he was during the course of the conversation. "I think the encounter has given me a window into the future in the sense that the science he described is true. And I think, therefore, that the science he described that hasn't been discovered yet is probably true, too."